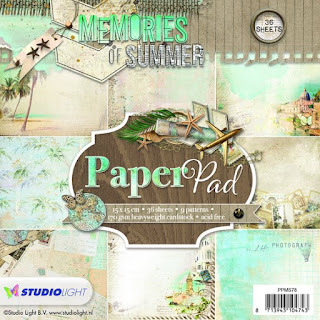 Using Studio Light's Paper Collection"Memories of Summer"
Do you ever have a hard time choosing background paper from a paper pad? I know I always end up spending more time trying to choose sometimes than I'd like to admit. Anyway, so what I have been doing is just combining different backgrounds from the same paper pad by simply layering them. In a previous project, using the same "Memories of Summer" collection, I die cut portions of the background paper and 3D foam taped it to the card. In this card, (pictured left) you can see that it is adhered all to the base. In this card, I have used three layered backgrounds. What is different about these layers? I decided to play with the contrast of using a black base for the card, and rather than distressing the backgrounds and using 3D foam tape, I have individually adhered each layer to black card stock, to help visually separate and call attention to each layer. I like to use black when the background graphics are busy in nature to be able to "pop" behind each background and to emphasize dimension. After adhering each of the three backgrounds to card stock of contrasting color, use 3D foam tape to prop each layer up on top of one another to create a tangible experience for the recipient. This card measures 6x6 and is a perfect size to give you plenty of room when you want to add detail. I can never add enough detail, but I strongly believe that it is okay as long as you are adding detail with a purpose. Detail with a purpose is when you tuck away details in between layers to create a connection between them, but also a fantastic way of keeping the viewer's eye busy! 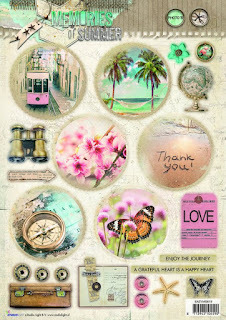 This collection is perfect for that, as it features die cut pages of ephemera, small flowers and travel themed accessories. This lovely collection is available at Cherish the Memory and I have provided links below. I hope you've gotten some insight on how to use layers and create dimension! Please let me know if you have any questions in the comments. I will have the links to the paper collection listed below. There are a total of three layers in this card : 1. The brown wooden background 2. The light creme colored paper background (Post Card layer) 3. The photo frame. 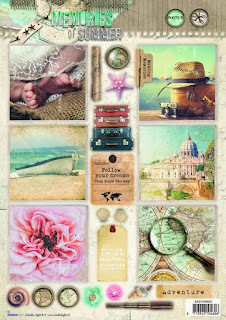 Starting with the embellishments at the top, you will see that they are what is connecting the background with the "Post Card" layer...and there you have it! You have created what I call a "connection" between the first and second layer. That's all there is to it! Whenever you have layers, always make sure to connect the layers with related items to the items you are using for the rest of your card, tag or canvas. To create cohesiveness, one must pay attention to not just connecting the layers, but to make sure to use related items. Related items are items that fit a theme, such as the butterflies I used or in this case all the travel accessory die cuts. What I like to always remember is figure out where you would like to guide the viewer's eye when creating a layout. For instance, if you'd like the visual flow of the card to flow from the top left to the bottom right you use details following the same path. With this collection creating cohesiveness and connecting layers is really a no-brainer. This is why I enjoy working with this collection so much because it makes project making super easy! Please feel free to ask me any questions below in the comment section. I hope you enjoyed my short blog post! Please take a moment to visit the shop links below. Most people send postcards from exotic places they are visiting when it comes to a tangible card form, but the reality is most of us nowadays use social media to share pictures of family at the pool or if you are travelling solo, pictures of your toes in the sand. Personally, the only time I have ever sent a postcard to someone is when they requested one, but I felt like it lacked something. Sure, it's perfect when you want something fast and simple to buy, but what if you were a crafter and wanted to make something a little more memorable? Cherish the Memory sells these fantastic 3D pre-die cut ephemera pieces that literally require just your hands to punch out! Meaning, you have the choice of bringing a few pages with you for some tropical crafting fun or a quick crafty make for when you come home from vacation, need some crafty time and or don't feel like unpacking just yet. The links to what you need to make this card is listed below. What I love most about these ephemera pages is that there's quite a variety of ephemera that resemble photographs, which you can easily use as a decorative item on your card or for an easy way to layer a real photo on top of, to create dimension. 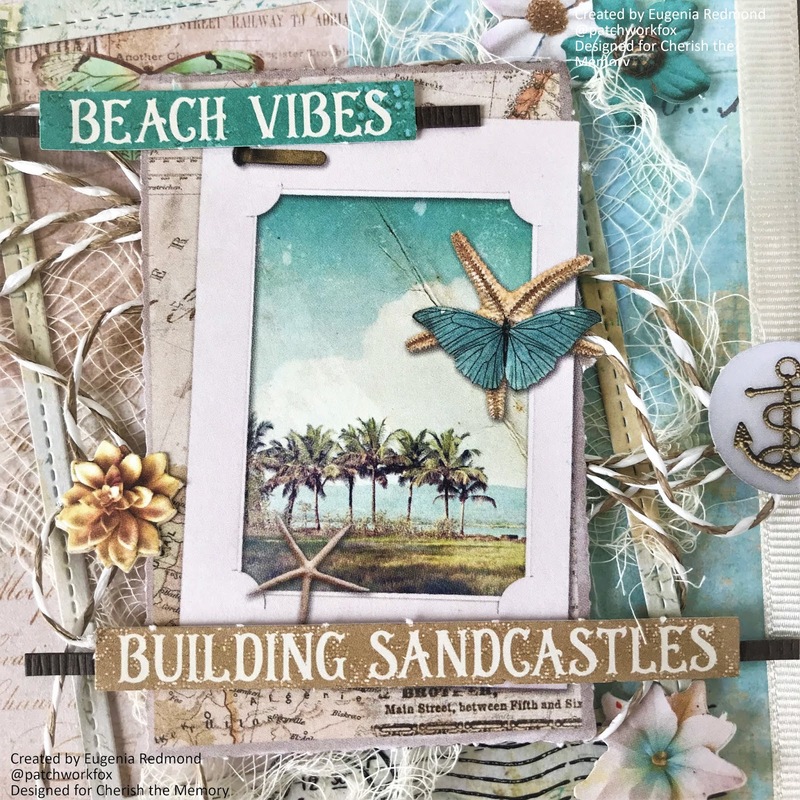 I particularly liked the "Building Sandcastles" sentiment, because it brought me back memories of my childhood where my mom bought my sister and I pails and shovels to use on the sand at the beach...perfect for when you have photos of some fun in the sand! Last not but not least, the flowers. There is a generous assortment of die cut flowers to choose from and these were particularly lovely as they were of the tropical kind! A great way to add a tropical or feminine touch to any card depending on how many you choose to use. There is no limit! I hope you have enjoyed my post. The links to these Studio Light papers are linked below! If you're anything like me, you're drawn to floral, feminine, colorful designs which can sometimes pose a challenge when making a card for a man, or for a female friend who isn't into "girly" designs as you are. 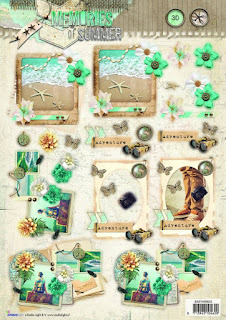 The "Memories of Summer" collection that you can purchase at Cherish the Memory really takes the guesswork out of picking and choosing paper for your masculine card. What is so great about this collection is that it has a good balance in range, therefore really allowing you to make both masculine, gender neutral and feminine projects without having to buy several collections! My favorite part of the collections by Studio Light are the paper pads, which I will be providing the link to below. I love the paper pads because it comes jam packed with backgrounds, but you see that you don't have to use the backgrounds just for backgrounds. If you look at the three rectangular paper pieces, they have been die cut from the paper backgrounds in the pad to create the layering effect where I used foam mounting tape. What I love most about this card is the use of neutral warm earth tones. Stick with natural colors such as browns and tans to get down the color scheme for a masculine card. I knew as soon as I saw the lighthouse from the ephemera pack that I would be using it, it's so pretty! 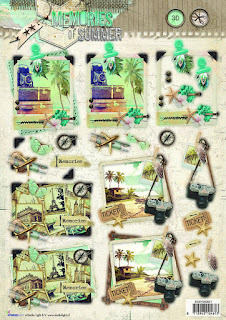 The vintage plane stamp was also a really cool feature in the ephemera pages which I will also link. 2. Take items from your stash that you have found yourself neglecting and throw things together to see if they complement the card. The background paper has a wooden grain texture which I had no plans for, until this card came up! 3. Jute adds a great natural element that is gender neutral. Texture in masculine cards is your friend. 4. Keep the design simple. I struggle with simple design but simple and clean is a must to achieve that perfect look. Masculine details can be pretty powerful, and you want them to speak for themselves and not overwhelm the card or viewer. 5. 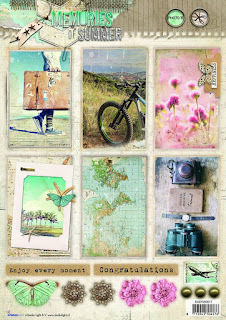 It helps to choose a 5x7 layout for a masculine card, the linear layout helps create a stronger card. Hello all! Welcome to my blog! 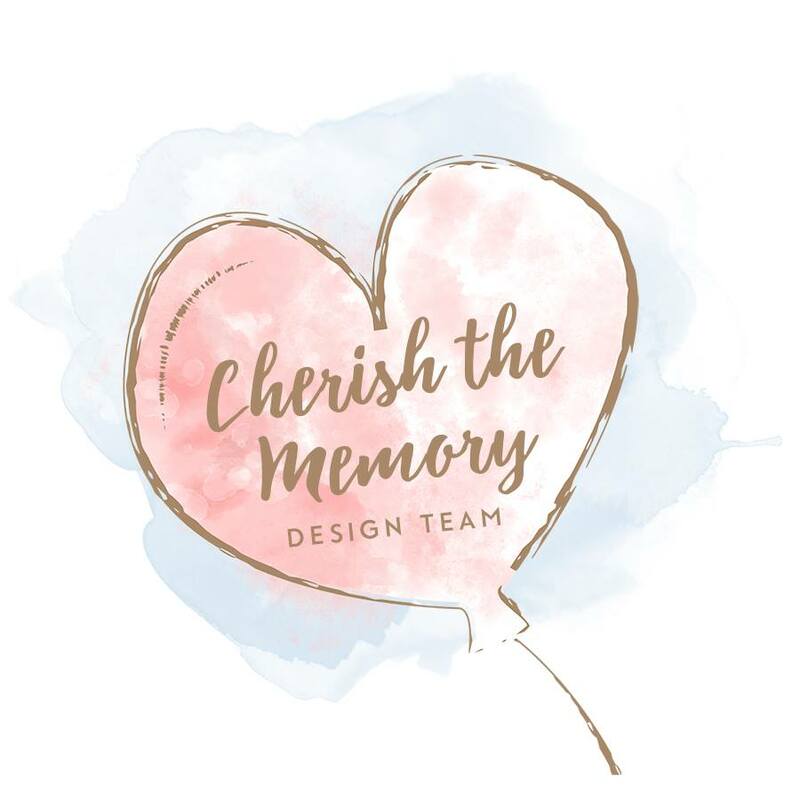 Today I will be sharing with you this mixed media canvas I have created for Cherish the Memory using Studio Light ephemera available at the shop. I will start out by saying that out of all the hobbies I have, I love love love making canvases the most! 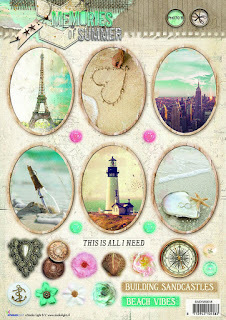 This canvas has taught me that you don't need a lot of paper to create a work of art, just some beautiful ephemera! I will be listing below links to this gorgeous ephemera at the end of the post. A must in my canvases is texture, the more the better! Experimenting with the combination of textures, whether it is a lot of different textures combined together, balanced, one simple texture, I believe there is no right or wrong. For example, in the background of the canvas I used two different stencils with modeling paste, in addition to art stones, and microbeads! If you notice, the shapes of textures doesn't stop there, I bring the texture over in layers by adding a layer of mesh and twine. I think it is important to tie the elements in the different layers to each other, so that they all sort of have this relationship and they marry into one another. I like to be cohesive. Speaking being resourceful, can you guess what that mesh is? It isn't store bought, it is mesh that I have repurposed from a laundry bag that was getting tossed out cut up into pieces. Here you can see the various layers creating dimension. The first layer is texture using stencils and modeling paste. The second layer is paper flowers with recycled mesh and twine. Third layer presents the ephemera. To create depth, you can see that I strategically place rhinestones in areas that need interest, like crevices, dark spots that need some light to reflect back to the viewer. I do this last! I hope you have something to take away from my post and thank you for visiting! Here are the links to the ephemera used in my canvas.